Century Old Town Prague - MGallery by Sofitel is housed in a Neo-Baroque style building in the heart of Prague’s historic city center, steps away from the Old Town Square. The hotel’s facade features beautiful architectural reliefs and was designed by Architect Alfons Wertmüller in 1894, the creative behind the iconic Prague State Opera and the National Theatre. 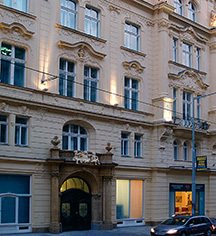 Guests to the hotel will enjoy learning the literary history of the building and its connection to famed Bohemian author and short-story-writer, Franz Kafka. The Century Old Town Prague offers guests the excitement of the city center and the relaxed charm of an Eastern Europe capital. The historic Century Old Town Prague boasts 169 recently renovated rooms that are accented by luxurious amenities. From classic rooms to the Kafka suite, guests will find calm and comfort after a long day of sightseeing throughout the city. Guestroom windows feature views of the Old Town Square and the famous astronomical clock. Amenities at this four-star city center hotel include a modern, internationally styled restaurant, intimate lounge, well-appointed fitness center, and 24-hour concierge desk. 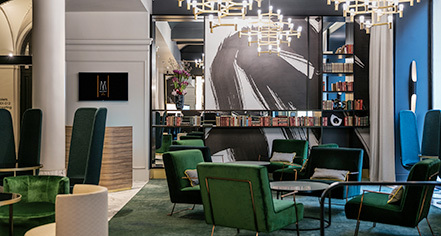 Guests can also lounge and relax in the hotel’s spacious and bright common area, known as the living room, which features contemporary furnishings, green velvet sofas, and geometric patterns while also staying true to the hotel’s unique past. When looking for places to stay in the city, the Century Old Town Prague is a traveler’s dream, as it is perfectly situated next to the Old Town Square, a starting point for exploring Prague’s Old Town, the Jewish Quarter, or the Wenceslas Square. History lovers will appreciate the many historical architecture styles and details that surround the hotel and should make sure to look up and around to absorb the area’s beauty. Century Old Town Prague - MGallery by Sofitel, a member of Historic Hotels Worldwide since 2018, dates back to 1894. Famed Bohemian author, Franz Kafka, once worked as an insurance clerk for the Workers’ Accident Insurance Institute of the Kingdom of Bohemia in room 214 between 1908 and 1922. Airport Transportation: An airport shuttle may be arranged for 650 CZK. Deposit: A credit card guarantee is required at check-in. Hotel/Resort Fees & Taxes: Included in the room rate. Parking: Valet parking is available for a fee. Pet Policy: €12 per pet, per night. Century Old Town Prague - MGallery by Sofitel is housed in a Neo-Baroque style building in the heart of Prague’s historic city center, steps away from the Old Town Square. Learn more about the History of Century Old Town Prague - MGallery by Sofitel .